Ron Palillo, best remembered for his role as the geeky and gawky, yet loveable Arnold Horshack who made up part of the quartet of Sweathogs on the ABC sitcom Welcome Back Kotter, died of a heart attack today at his home in West Palm Beach Florida. He was 63. Palillo’s death marks the second death of an actor who portrayed a Sweathog on Welcome Back Kotter. Robert Hegyes, who played Juan Epstein, died in late January of this year. The surviving members of those fun-loving high school juvenile delinquents who helped make the show such a success during its original run from 1975-1979 are Lawrence Hilton-Jacobs (who played Freddie “Boom Boom” Washington) and of course, John Travolta, who played Vinnie Barbarino. After Kotter ended Palillo did some work on various sitcoms and started to do voiceover work as well for many animated series during the 1980s, the cartoon version of Laverne and Shirley, the voice of Rubik The Amazing Cube, and stints on Darkwing Duck were part of the Palillo resume. He was an illustrator for children’s books and performed in some Broadway productions also; Amadeus, Who’s Afraid of Virginia Woolf, and Guys and Dolls were the standouts. The Washington Post reported that Palillo, who was a heavy smoker, had felt typecast by the role of Arnold Horshack on Kotter and thus was what prevented him from getting any real solid work thereafter, although he also had love for his memorable character. His longtime partner Joseph Gramm was with Palillo at the hospital in Florida when he passed away. 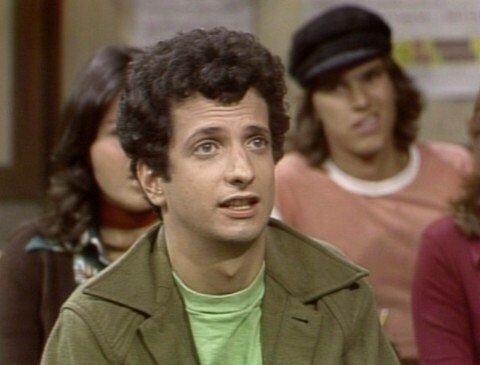 The character of Arnold Horshack certainly overshadowed anything else in the life and career of Ron Palillo. He will always be remembered as said character, by the millions of fans like myself and many of my generation who grew up with him in the mid 1970s and now feel the chagrin of experiencing yet another passing, which closes the iris of one’s childhood ever so more tighter now.